Watch an interview with Travis at Summit Daily's website. PUBLISHED IN SUMMIT DAILY: Starting into its sixth year, The Peak School in Frisco sees itself as past the stages of crawling and walking; the county's only private secondary school hopes to now begin hitting its stride. round population continues to grow, so too will the need for academic alternatives to suit all students. "I looked at Summit County, as we're the only offering for independent schools, and I saw a place that could really capitalize on our relationship with the community," said Travis Aldrich, Peak's new head of school. "I really felt like I had a vision for where this place could go, and I felt like I had the answers. I saw the potential for growth here and that's a real opportunity for us." 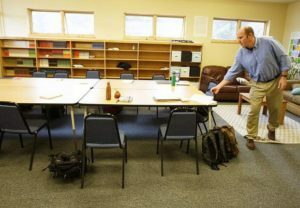 Aldrich, 41, arrives to Summit after nearly 20 years as a teacher and administrator at other independent programs on both coasts and in Colorado. Most recently, he spent four years as the director of the high school program at the Vail Mountain School in Eagle County. With an extensive background in coaching and as a summer camp counselor, Aldrich believed engaging students and families in lesson plans outside of the classroom could really separate the school from what others in the community could provide. "That allows teachers to connect, and I think that's a really big piece about a quality education, is having teachers that interact with students not just in the classroom, but outside the classroom," he said. "Great schools allow teachers that option. The more opportunity they have to interact with students, the more that they're going to trust each other, and I think that's a big piece of where things go." In past years, Peak began each school year with an orientation field trip for every student to attend together and gain familiarity with instructors in addition to each other. To kick off the 2017-18 academic calendar, however, those options were expanded to three choices — a canoe trip in Moab, a team-building ropes course experience and a hiking trip to explore a canyon in southern Colorado. Students can also look forward to other upcoming outdoor opportunities, including a mountain day with an assortment of area activities, from hiking and fly-fishing, to bicycling and paddleboarding. On top of an annual rafting trip, several hut trips throughout the winter are a part of the standard curriculum, too. "And we're looking at enhancing those programs, because we really feel like it's something that all of our students and families really believe in," said Aldrich. "We really feel like that helps to separate us from other opportunities in the county." Still boasting key components like the county's only Chinese language instruction and a nontraditional, mastery-based grading system that runs on a six-point scale rather than the standard 'A' through 'F' framework, the program continues to stress the importance of a high academic rigor. Into just its second round of seniors, the employing of a part-time college advisor, who may soon shift to a full-time role, helps emphasize the value Peak intends to put on post-secondary placements looking ahead. With just 70 or so students, class sizes remain small — in some cases as few as eight — providing for more personalized attention and one-on-one interaction between teachers and students. That comes at a price, of course, with the current cost of attendance at $17,500 per year. However, Aldrich said more than 70 percent of families receive some amount of financial assistance, and maintaining the ability for anyone who fits the Peak mold to attend is central to the board's mission. To bring more students into the program with its flexible afternoon scheduling — and that provides seniors a full quarter for work on their capstone project in any part of the world to pursue their passions — another element of intended to boost attendance is appealing to more elite athletes who call Summit home at least part of the year. The goal is to attract a larger number of ski racers who have aspirations of high-level competition, and aligning the Peak's daily class obligations to the regional training schedules will help secure those types of recruits. As an articulated building block for The Peak School's model today and into the future, the thought is the program will become a destination for these specialized students who require online and remote learning opportunities to complete their studies. And from there, it may only be a matter of time before the transition from crawling and walking to running becomes a full-on sprint. "Look where we are," said Aldrich. "We have a ton of ski areas around us, we need to be capturing more of those winter sport athletes. I think we're going to see more and more families start to get curious about our program and want to know more about it. And when they come in and they hear about how supportive we can be, I think it's going to be a natural draw."